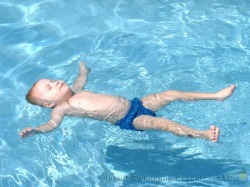 Infant Swimming Resource is the safest and ONLY provider of comprehensive swimming and aquatic Self-Rescue™ instruction. Our method of behaviorally based instruction emphasizes developmentally-appropriate skills training to ensure that your child is learning Self-Rescue skills and developing the competence required to enjoy the water. ISR lessons in my Winter Springs home concentrate on teaching children to become efficient swimmers and floaters in any depth of water. 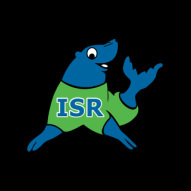 ISR lessons can greatly increase your child’s chance of surviving an aquatic accident, even when your child is fully clothed! Our main focus is survival. 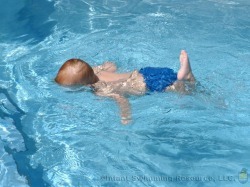 Florida has the highest accidental drowning death rate in the United States for toddlers 1 to 4 years old. Pool fences, alarms, gates, locks and survival swim lessons are essential layers needed between your child and the water! It only takes a momentary distraction for a curious toddler to get out of your sight. ISR Self-Rescue™ uses both verbal and non-verbal cues to teach children as young as 6 months. Even though your child might not communicate verbally yet, he or she can learn to Self-Rescue™. Remember, your child may not talk, but he or she has learned to crawl, walk and run. That is the only skill they need to find themselves in water danger. All lessons are private one-on-one instruction, scheduled Monday through Friday for a maximum of 10 minutes each day at my home in Winter Springs, FL. The individualized lessons are customized for each child’s learning pace and physical abilities. Parents and caregivers are encouraged to watch lessons; however, they will not get into the pool on a daily basis. Once the child is competent with all skills, those parents who wish to swim with their children will be shown how best to practice and enhance their child’s safe swimming skills. All skills for all children are initially learned and stabilized in a swimsuit. But, because most children drown while fully clothed, their skills will then be practiced and stabilized while wearing summer clothing and then winter clothing.